Possibly the fastest way to create curls for any hair type is by using a hot curling iron brush. However, with so many different makes and models available on the market, it’s difficult to choose the right one. 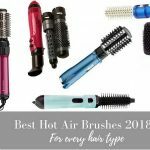 Rather than investing a small fortune in buying a collection of hot curling iron brush models, we’ve done the hard work for you and selected our ten favorites, listed their benefits and what we think of them. Have a read before you make your choice and hopefully, you’ll soon be blessed with those long-lasting curls you dream of. We have included our top 3 models below. Read our article below for a comprehensive guide for all the details you need to understand the important features of curling iron brushes. A straight haired girls very best friend, there’s lot to be said for the new generation hot curling iron brushes but there are so many to choose from, it’s difficult to work out which is best for your hair type. Even if you have curly hair, you might well find the benefits of hot curling iron brushes just so good that you have to have one! What Is A Hot Curling Iron Brush? How Does A Hot Curling Iron Brush Work? Will A Hot Curling Iron Brush Damage My Hair? What’s the Difference Between the Curling Iron and Curling Iron Brush? Curling Iron Brush Vs. Rollers? Curling Iron Brush Vs. Curling Tong? A hot curling iron brush is what it sounds. It’s a brush-like heated hair tool that curls hair. It looks like a brush, with bristles (or ceramic teeth) and the handle has switches that control the temperature along with the speed. Now, some hot curling iron brushes are different than others. Some are only for use on dry hair but others can dry hair as they style. It’s very important that you choose the right one for what you want it to do, don’t confuse them! We also prepared a comprehensive guide for the best Curling Iron. For the curling iron brush that just curls (doesn’t blow hot air), you must have already dried hair. Plug it in and select the temperature you desire and then curl a section of your hair using the brush once it’s heated up. For a curling iron brush that dries while it curls, you use it a little like a hairdryer and style your hair as it blows hot air through the vented channels down the center of the barrel. You get a different curl with each brush. The hot curling iron brush that styles on dry hair will produce quite a defined curl whereas the hairdryer version gets lots of body and volume, creating big, bouncy curls. The million dollar question! Any heated styling tool that isn’t used with care and attention could easily damage your hair, but if you take steps to protect your hair properly from the heat and you use the tool at the correct temperature for your hair type, you shouldn’t inflict any damage. Don’t over-use heated styling tools on your hair and don’t keep going over and over the same section as this weakens hair, leading to split ends and breakage. These are the hot curling iron brushes that dry hair as they style. The rotating barrel cleverly blows air from all different directions really plumping out hair and giving it lots of volume and body. These rotating barrels are an excellent feature but, they take some time to master. The trick is to allow the styling tool to do the job for you and to train yourself to resist moving the barrel yourself. Takes time, but once you’ve worked it out, you’ll really see the benefits! This type of technology alleviates that flyaway hair problem and also tames frizz because it banishes positive ions that are found in wet / damp hair. It’s these ions that make hair frizzy and using ionic technology, they are converted into negative ions, thus getting rid of frizz. There are usually two types of bristles on curling iron brushes, either regular, flexible bristles or ceramic coated. Both of these are there to do a different thing. The ceramic coated bristles heat up while the other type does not. The coated bristles style hair using heat, enabling you to create defined curls. The other bristles work as a gripping mechanism, used while you style hair with a curling iron brush that emits hot air from the body (so you dry hair while styling too). There are also different size curling iron brushes. This is important because you need a certain size according to your hair type. So, for example, if you have short hair or you want to create small curls, choose a 1 inch barrel. For mid-length hair, choose a 1.5 inch barrel and for long or thick hair choose a 2 inch barrel. If you have short hair and choose a 2” barrel, you won’t be able to use it properly. Some curling iron brushes come with sleeves or silicone heat resistant mats that protect the irons when not in use. I use these mats to protect my bathroom sink from heating burns when I style my hair. These mats are also useful for traveling with my styling tools. Because of how hot some of these tools can get, I use a silicone curling iron holder in my bathroom. Its a good way to stay organized and it prevents my hand or arm from accidentally bumping against the tool before it cools off. Generally, curling iron brushes come in three different types of materials, ceramic, tourmaline and titanium. All of these materials are good heat conductors and have similarities, but they also have differences. Ceramic holds heat well and usually distributes it fairly evenly, however, once ceramic is chipped or damaged, it reveals “hot spots” and these areas heat up to very high temperatures when switched on, therefore can damage hair. Titanium, on the other hand, heats up faster than ceramic and delivers very even heat distribution. There won’t be cold spots or hot spots and you get better shine than ceramic. Titanium is a good long-term purchase as it doesn’t corrode at all. It’s a good bet if you have very thick, course and unmanageable hair because it’s very strong. Tourmaline naturally produces negative ions, so this material is exceptionally good for taming frizz and flyaway. This material does heat to very high temperatures so isn’t the best material if you already have dry, brittle or chemically treated hair. However, if you have fine hair that isn’t damaged, you can use tourmaline curling iron brushes. Also bear in mind that tourmaline wears out faster than ceramic and titanium. Whichever material you use, remember that even if your hair is in excellent condition, if you don’t take the right steps to protect your hair, you run the risk of damaging it. So always use a good heat protection spray and set the temperature according to your hair type (low for fine or damaged/chemically treated hair, higher for thicker hair and hair in good condition). There’s no need to use the top temperature for any hair type. Well, firstly they look different. A curling iron has been on the market for a very long time. 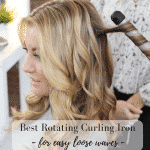 They work differently in that you place hair around the iron (which has no bristles) and then clamp down a second piece onto the section of hair in order to curl it. A curling iron brush does not have the second clamp piece and looks like a curling brush (except it is controlled electronically). You wind hair around the barrel and depending on whether you have a hot air brush or a curling iron brush; your hair will be curled accordingly. The brush that heats up will define a curl on already dry hair; the hot curling hair brush will style hair as it dries, so it can be used on towel-dried hair. The main similarity between a traditional curling iron and a curling iron brush that heats up its bristles is both will create a defined curl. However, the newer technology on the curling iron brush is safer for use on hair as it uses heat from the hot bristles. The two are totally different. Hair rollers work by winding sections of hair around different size barrel shape pieces and waiting for hair to dry (either using cool rollers or heated rollers). This can take a while. Curling iron brushes create curls in seconds, by winding hair around a barrel with heated bristles. The curling iron brushes that emit hot air, dry hair so it has voluminous curls, rather than defined curls. Heated rollers and “cold” rollers are quite old-fashioned. A curling tong or wand is a slender barrel without any bristles and the barrel is the area that heats up. You wind dry hair around the barrel, hold it for a few seconds and then release a curl. The curling iron brush works differently in that it has bristles that grip hair, you wind hair around it, curl it upwards, hold for a few seconds and release a curl. You probably will get similar results using the two but a curling iron brush is kinder to hair as the bristles emit the heat rather than using a very hot wand directly onto the hair. Spray hair liberally with hair protecting spray. Heat up your curling iron brush to desired temperature. Unwind first section (best from the back) and wind the hair round the curling iron brush as far as you can go. Keep hair wide for looser curls, tight for tighter curls. Hold for just a few seconds. Pin it back to head to define the curl. Switch curling iron brush so it blows hot air. Style hair as if you are using a manual curling brush (no hairdryer required). Remember to use the right barrel size according to your hair type. That means small brush for tighter curls and shorter hair, bigger brush for more voluminous curls and longer, thicker hair. This product is a hot ceramic brush that is only for use on already dry hair. It’s a good product to choose if you want small curls or if you have short or fine hair. That’s because it has a very slender barrel. Made out of ceramic, it’s a relatively good heat distributor and the non-slip handle gives good control while styling. The bristles do not heat up though; they are soft, flexible bristles. The body heats up instead so hair is smoothed as the brush glides through. This is great for creating smooth looking curls and adding volume and body. It is made out of tourmaline and ceramic so it’s an excellent heat conductor, providing really even heat distribution so it shouldn’t damage your hair as long as you use it properly. Boasting negative ion technology, it whips away frizz and delivers lustrous locks. It also keeps hair sufficiently hydrated as it locks moisture in. Expect exceptional shine and healthy looking hair. This product comes with a thermal protection sleeve and the 1.25” barrel is suitable for mid length, mid thickness or similar hair. Note, this is not suitable for use on wet or damp hair. This model offers a combination of a flat iron with a styling comb that creates waves, volume, and body. This model generates heat of up to 450 degrees. The titanium plates and consistent heat result in smooth, stylish hair. This option provides great results for all hair types. We love Conair; they’re one of the best-known American brands for hair tools and have plenty of experience when it comes to hair technology. This one is lightweight, neat and quite portable too. It comes in sleek and stylish black and consists of a titanium barrel which provides excellent ionic benefits so hair isn’t frizzy and doesn’t have any static. Complete with nylon bristles, it’s kind to your hair and creates silky, bouncy and soft looking curls that look exceptionally natural. What we love is the titanium technology meaning that it heats up evenly and keeps hair in place all day. There’s also a useful LED temperature control so you can keep an eye on the temperature. As a tip, keep it low if your hair is fine, damaged or chemically treated, raise it for thicker hair. Another one from Conair, this one is coated in silicone which is excellent for conducting heat and is kinder to hair so promises less breakage. It’s a funky looking ceramic hot curling iron brush with cool bright pink bristles – ideal for the girly girl! This one delivers plenty of shine and the brush is very comfortable to use which means that it is easy to control. It also boasts the latest ionic technology so there’s less frizz and static to worry about and if you’re in a hurry, it heats to your desired temperature setting (choose out of five) within 30 seconds. This one guarantees 24 hour curl control, even if you’re in very hot and humid conditions – it does hold curl but perhaps not in really damp heat, however, it’s still pretty impressive! OK – you could say we’re Conair fans and we are; they do understand how to create long-lasting curls! This brush is a steal and it delivers tangle-free curl styling, plenty of body and shiny, smooth curls. The curling iron brush is fairly small at ¾ of an inch so if you want little curls or you’ve got shorter hair this is the right one for you. The extra-long swivel cord means there’s enough room to get to the back of your head comfortably and the aluminium barrel is kind to hair, conducting heat well so no nasty hot-spots. It’s small, lightweight and ideal for travel; the only downside is the one heat setting. If you’ve got the cash to spend then you might want to make this investment. This brush is more expensive but for the money you get a high quality product. It delivers volume, body, curls and waves and it’s exceptionally comfortable to use with an ergonomically designed handle and easy-grip, there’s no risk of wrist-ache! The brush works with a clip that holds hair into place and a switch determines when to release it plus it doesn’t catch or snag hair. It also has a cool-touch tip so you won’t burn your fingers and the tourmaline ceramic barrel keeps hair looking hydrated and shiny. With five different temperature settings, it’s the perfect hot brush for any hair type. This is a best-selling heated curling iron brush. Boasting a silicone brush with flexible bristles that move while you style, it delivers good heat distribution so there is less damage to hair and plenty of fabulous shine. The barrel is 1” in size and there are two heat settings with an indicator light so you know when the tool is switched on. The tip is cool to the touch so no burnt fingers either. It is a great curling iron but it lets itself down slightly with just two heat settings. This one is small and neat with a ¾” barrel and a superb choice of ten different heat settings so it’s suitable for all hair types. The handle has a soft-grip finish which means your wrist won’t ache after finishing a head of curls and the brush comes with an extra set of replacement bristles meaning this brush lasts…and lasts! With fast heat-up it’s good when you’re in a hurry and styles curls super-quick. They really last all day, even after sleeping on them, no need to go over any flat areas. When you want bigger curls or you’ve got long hair you need a larger barrel. The Helen of Troy has a huge 1 ½” barrel which is ideal to cope with lots of hair. This brush also won’t break the bank. It comes with two heat settings and a tangle-proof long cord so you get right to the back of your head in comfort. The end of the brush has a cool tip so there’s no chance of burning your fingers. Negatives include the time it takes to heat up and if you’re not careful you might catch your hair in the join. However, it does create the long-lasting big curls you’d expect from this product. Sometimes it’s better to have a product that does more than just one hair style and this tool delivers straight hair or curly hair so it’s a wise investment. This tool is essentially a curling wand, flat iron and hot round brush with ionic bristles so you get a remarkable shine and hydration stays locked in. That means no frizz, no flyaway and no static. 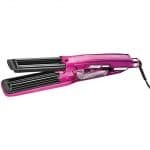 It also has 1” tourmaline and ceramic plates which are safe to use on all hair types (provided you use them at the right temperature for your hair) and there are plenty of different heat settings. For curling, you lock your curl into place until it’s ready to release and when you do release it you get a defined looking natural curl. We love this for its multi-purpose benefits and if you’re travelling, why take lots of tools when this one does it all? Plus it comes with its own travel case. A fusion styler means it delivers lots of different styles in one tool and Asavea is excellent at developing up-to-the minute hairstyling technology. This cute pink hot tool delivers curls or straight hair and it’s detangling too so hair is smooth and shiny no matter what you want to achieve. With eleven temperature settings, it’s suitable for all hair types and it heats up really quickly. It also has ceramic and ionic technology so heat is evenly distributed and there’s no chance of frizz of static. Finally, the outer area of the curling iron brush stays cool which means you can wrap hair around it without worrying about burning your fingertips. This larger heated styling tool is ideal for long or thick hair because the barrel is 1 ½” in size. It’s made of tourmaline which is a very good heat conductor and it also has ionic technology which banishes any static or frizz, locking in hydration for more shine. The rubber handle is comfortable to use and as this item has dual voltage it’s ideal for travel, anywhere round the world. Flexible bristles mean no tangling and it’s gentle on hair, still creating those curls you dream of. It’s a good overall hair tool that will last you for years.